Sgt. Anthony Egan, left, holds Mo Justice the rooster, who was rescued from the middle of a Flatbush intersection earlier this month. The rooster, right, is now living at Farm Sanctuary, an animal rescue farm in upstate New York. FLATBUSH — Why did this rooster cross the road? To be rescued by one very determined NYPD officer. 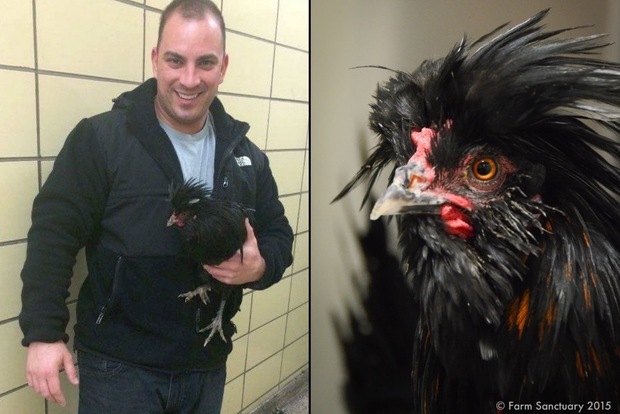 Earlier this month, members of the 67th Precinct found a male rooster wandering in the middle of Flatbush and Snyder avenues in the neighborhood — and immediately called Sgt. Anthony Egan, who took the bedraggled bird under his wing. The six-year NYPD member and Marine reservist kept the rooster, who was in “a real bad state,” he said, in the precinct house while he researched the best place to send him. And as the rooster — now named “Mo Justice” — hung out with Egan, he became more and more friendly. That day, Egan secured a new home for Mo Justice at Farm Sanctuary, a 30-year-old animal rescue in upstate New York that has recently partnered with Tracey Stewart, Jon Stewart’s wife, to build a new farm in New Jersey. Susie Coston, Farm Sanctuary’s National Shelter Director, says she personally took Mo Justice in after he arrived upstate, listless and suffering from an infection. But, with antibiotics, he’s making a speedy recovery. “He’s already looking 100 percent better,” she said. 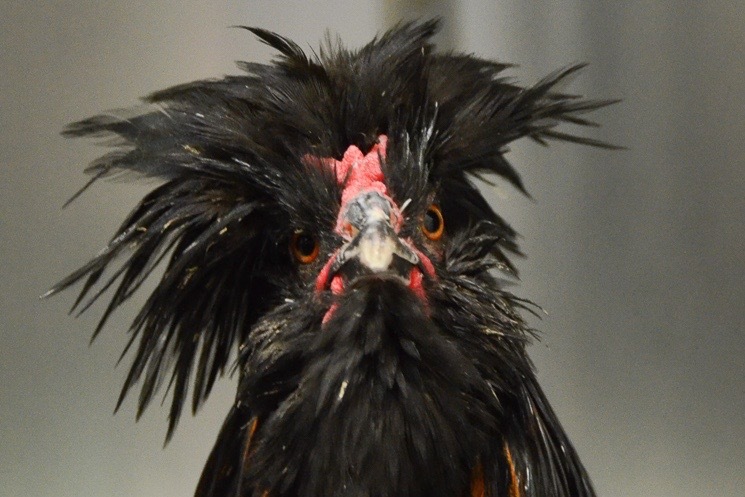 And when he’s totally healed, he’ll join the 170 other birds at the sanctuary — many of them rescued from the city, she said — and be permanently paired with a group of hens. “He’ll have a flock of his own,” she said. Mo Justice is a special French variety of bird known as a “Crevecoeur,” Coston said. She guessed he may have been mail-ordered by someone looking to start a backyard coop or, perhaps, he may have escaped from a Brooklyn poultry distributor. However he ended up in the middle of that Flatbush intersection, she said, it’s clear that Egan swooped in at precisely the right time. “The officer definitely saved his life,” she said. Egan is glad he found a home for the rooster and hopes Mo Justice’s story encourages people to care for animals the same way he does.